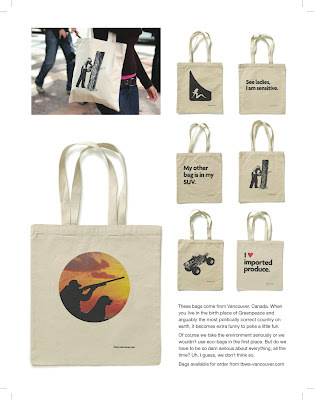 TBWA\Vancouver has launched a line of environmentally-friendly bags, turning the standard shopping bag into a fashion accessory. These bags have generated buzz as far away as London and New York, winning awards and becoming a local in-demand product. The bags feature cheeky headlines such as, “See ladies, I am sensitive” and “My other bag is in my SUV”. The bags were intended to steer away from the too-earnest feeling of most environmentally-friendly products, and for this reason, several of the bags feature incongruous images such as a logger at work or a monster truck.